The legendary four return to the stage once again! Why See Million Dollar Quartet? The Hit Broadway Musical is back! 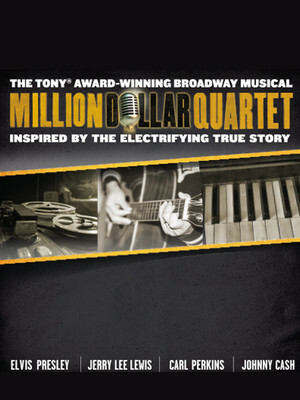 The legendary four return once more in this limited tour of the Broadway hit musical, Million Dollar Quartet! Experience the magic of Elvis, Johnny Cash, Jerry Lee Lewis and Carl Perkins on stage together with all your favorite songs, including Blue Suede Shoes, Fever, That's All Right, Sixteen Tons, Great Balls of Fire, Walk the Line, and MANY more! Million Dollar Quartet is not just about the music. The songs are all laced together with stories and anecdotes from the famous foursome and the manager of Sun records, Sam Phillips. The show acts as a mini-history lesson about the birth of rock 'n' roll, and the wider social changes that were afoot at the time. WHAT IS MILLION DOLLAR QUARTET ABOUT? On a cold and wet December night in 1956, four young musicians gathered at Sun Records in Memphis for what would be one of the greatest recording sessions ever. 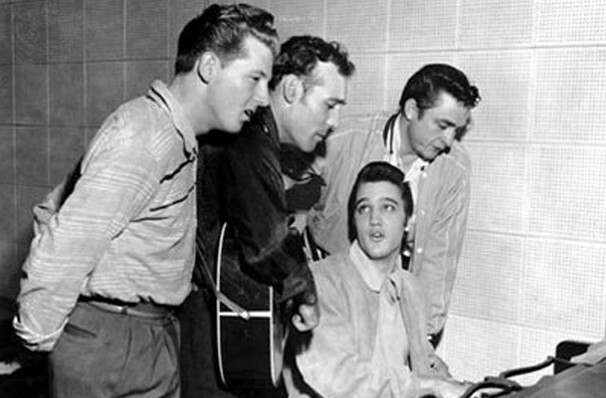 You may have heard of them - they were Elvis Presley, Johnny Cash, Carl Perkins and Jerry Lee Lewis, between them making up the eponymous "million dollar quartet". Not an easy feat back in the Fifties! This impromptu jam session would become the basis of musical legend, four icons of the rock 'n' roll era together singing and recording in one room for the first and only time. Fortunately for the rest of us, the sound engineer who was working at the time was smart enough to press 'record'. And thanks to this quick-thinker, we have the chance to re-imagine the goings-on in that studio. Sound good to you? Share this page on social media and let your friends know about Million Dollar Quartet at 710 Main Theatre. Please note: The term 710 Main Theatre and/or Million Dollar Quartet as well as all associated graphics, logos, and/or other trademarks, tradenames or copyrights are the property of the 710 Main Theatre and/or Million Dollar Quartet and are used herein for factual descriptive purposes only. We are in no way associated with or authorized by the 710 Main Theatre and/or Million Dollar Quartet and neither that entity nor any of its affiliates have licensed or endorsed us to sell tickets, goods and or services in conjunction with their events.